The reigning Pikes Peak Hill Climb champion for the past 6 years, Nobuhiro 'Monster' Tajima, will switch from a gasoline-powered vehicle to a new prototype EV racing car to break his own course record. Team APEV (Association for the Promotion of Electric Vehicles) has announced plans to enter an electric vehicle in the 2012 Pikes Peak International Hill Climb taking place on July 8th. Only a render of the racer has been released without any technical details in English. We gather from the slide show presentation during the recent press conference that the APEV Pikes Peak EV will be a tubular space frame chassis single seater enclosed by a high downforce, wind tunnel developed, body complete with bubble canopy. The EVs powertrain will be AWD with front and rear in-board axial flux electric motors driving each pair of wheels via a differential. The current EV record stands at 12:20:084 set last year by the a Yokohama supported rear-wheel drive, open-wheel EV powered by an AC Propulsion power train with approx 270hp. 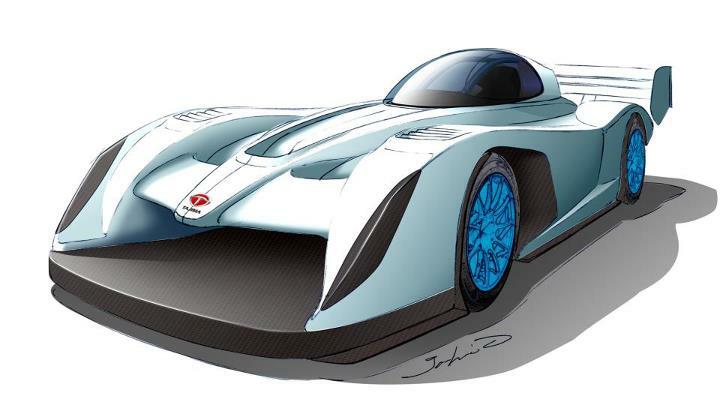 Mitsubishi have also announced plans to enter the EV class at Pikes Peak in 2012 with a i-MiEV single seater Prototype using the same EV components as the current production i-MiEV. In 2011 'Monster' became the first driver to break the long-coveted sub-10-minute barrier setting a new course record of 9:51.278 driving his 910 HP 2.7-liter Twin turbo V6 AWD sport prototype Suzuki SX4 over a combination of tarmac, gravel and dirt. Although the entire 12.4-mile 156 turn Pikes Peak course is all tarmac for the 2012 event, it will still be quite an achievement for an EV to break the current sub 10 minute outright course record. You can follow the APEV teams progress via their Facebook page.